If you were impressed with Dullahan and Bodemeister, he’s the only horse to have finished in front of both of them. With the top end such a toss-up, it’s difficult dropping him at this point after having him on top for so long, especially with question marks surrounding the others. Harrington had the blinkers removed for his final prep, but who knows if the change helped or not. Although you hate to see an equipment change so close to the Derby it does show he’s pretty consistent with or without blinkers and still is right there in every race. The feeling here is that he’s right where he’s supposed to be, despite the late equipment change. I still believe the whip has been the culprit in his meandering stretch runs. Whenever he’s been hand-ridden he’s run as straight as the proverbial arrow. Love that he’s had three preps, especially a seven-furlong sharpener, and has gotten any “bounce” out of the way, although the SA Derby was a bigger bounce than you’d like to see right before the Derby. But he does have a “0” on Thoro-Graph to fall back on, and with his stamina, high cruising speed, ability to sustain his run, and grind ‘em into the ground style of running he should relish the 1 ¼ miles. I’ve been waiting to put this guy high up for quite a while and had rocketed him up to No. 5 off his second in the Palm Beach. He just needed a performance like the Blue Grass to prove he can beat top-class horses and do it impressively. The opinion here is that no horse has moved forward more dramatically from 2 to 3. He’s grown up physically and mentally, and for a big horse is unusually athletic and light on his feet. He can accelerate quickly, yet he can sustain his run a long way and doesn’t mind negotiating his way through traffic. He resembles his half-brother Mine That Bird as much as Laurel resembles Hardy. But what they do have in common is their ability to explode from the back of the pack. Poly or no Poly, he did come home in :23 3/5 and :11 3/5. The only loose end is having only that one dirt effort since last July with which to evaluate him. But his BC Juvenile was good enough to remain confident. And he does have the best money rider in the country. Call this a three-way photo for No. 1. I’ve been so tempted to put him in the top spot since the Florida Derby, and after Saturday’s monster performances he could wind up a huge overlay in the Derby. If he gets to Kentucky and trains like Barbaro, he could easily move to the top. There are some who have concerns about his ability to get the 1 ¼ miles and feel he should have had more punch in the Florida Derby, despite being given a lot to do. It’s true he didn’t have his usual push-button response when he was asked at the three-eighths pole, but I still believe he was nowhere near 100 percent sharp and tight for the race, having only one easy victory in nearly five months and only three slow breezes (:50 2/5, 1:04 1/5, and :49) between the Fountain of Youth and Florida Derby. If I had this horse and felt he was far superior to the others, I might be inclined to think or hope he could win the Florida Derby on sheer talent, while making sure he wasn’t fully cranked for the race and risk having him peak a race too early. You can tell he was fresh and ready to roll by the way Leparoux was pulling back on the reins while being boxed in on the rail. I believe he didn’t accelerate nearing the quarter pole because they went that quarter in a brisk :23 4/5 and he had a wall of horses directly in front of him. He still managed to close his final three-eighths in :36 flat. We know he possesses that Derby-winning move on the far turn and there’s no reason to think he won’t be ready to fire off his biggest shot on May 5. The philosophy behind his preparation is totally different than that of Creative Cause. He avoided the “bounce” by waiting 8 weeks between races after his “1 ¼” in the Lewis, but bounced anyway, and now has 4 weeks to the Kentucky Derby. Which will prove to be the better strategy we’ll have to wait and see, because we really don’t know how good this horse is and how much upside he still has. We may only be seeing the tip of the iceberg with him. We know he’s fast and he’s battle-tested, and now it’s just a matter of how he recovers from the Santa Anita Derby with only a limited 2-year-old and 3-year-old foundation under him. There is little doubt this is an extremely talented horse to have done what he’s done in his two starts this year. You won’t find a more class- and stamina-oriented female family (American and European), with names like Arch, Kris S, Pleasant Colony, Roberto, Caucasus, Hail to Reason, Princequillo, Alydar, His Majesty, Stage Door Johnny, Nijinsky, and Sea-Bird. And add male influences Sadler’s Wells, Tom Rolfe, Northern Dancer, Vaguely Noble, and Lyphard, as well as inbreeding to Mr. Prospector and Danzig, and a bit more removed, Ribot. I cannot recall ever seeing such a loaded pedigree and Who’s Who of European greats. As the final day of Passover concluded, a plague was unleashed on the unsuspecting participants of the Arkansas Derby that destroyed everything in its path. That plague came in the form of a flashy bay named Bodemeister, which begs the question: why is this horse different from all other horses? To be honest, no one seems to know. He appeared innocently enough in a maiden race as second fiddle to another Baffert colt and had jaws dropping with his other worldly performance. Two races later he did it again in the grade I Arkansas Derby. It is encouraging and unusual to see a horse turn in such a brilliant performance and show so much speed with the blinkers off. The only concern now is that he has to come back in three weeks after earning a whopping 108 Beyer figure , so you have to wonder how this race will affect him, especially being so lightly raced and with no 2-year-old foundation. There are two ways to look at this phenom. It’s possible he is improving so rapidly he’s already climbing toward superstardom. You don’t see many frontrunners coming home their last eighth in :11 4/5 (he’s done it in his both his wins) and running a full second and a fifth faster than the nation’s top older horses the race before. Add to the fact he has stamina screaming from both sides of his pedigree. On the other hand, the Arkansas Derby was far from the strongest field, and he will have to contend with some brilliant pace horses in the Derby. He may be favored in the Derby, but being a pure speed horse is what’s keeping him at No. 5. Yet I can see him pulling a War Emblem or Spend a Buck. I just know this colt looks to be something special and is getting scary good. I am well aware this colt is ranked too low, but I’m committed to others at this point, and there is little separating him and the top 3. You have to respect any horse who has never lost, is still improving, and can beat you in many different ways. And, yes, he’s by one of my all-time favorites, Tiznow, whom he resembled in the Wood Memorial, the way he dug in and fought back. One of my problems with him is that, like El Padrino and Take Charge Indy, he won’t even be seen on the track until the Wednesday before the Derby. To him it shouldn’t matter much, as he’s 2-for 2 at Churchill, but strictly from a personal standpoint, I’d like to see more of a horse as he prepares for the Derby. He did loaf a bit after taking the lead in the Wood, but that should not be an issue in the Derby, where I doubt he’ll be in a position to loaf. One thing that won’t be lacking in the stretch is competition. In short, he’s going to be very dangerous, and although I’d love to have him higher up, I’ll have to be content keeping him here, at least for the time being. Ok, I’m looking at the odds on Derby Day, trying to find an overlay who actually has a good shot to win and will pay a big price in this wide-open betting pool. My guess is that this is the horse that jumps off the board. So I might as well put a few bucks aside right now. McLaughlin, Godolphin, (Dominguez or whatever big-name rider they get), Bernardini, and this improving, stretch-running colt will make a formidable team. He certainly can be excused for coming up a little short in the final yards of the Wood, considering he clipped heels on the first turn, had to check pretty sharply, and came back with some lacerations. And on top of that was coming off an eight-week layoff and going up against a talented and undefeated colt in Gemologist. His race actually fits the pattern of past preps where the Derby winner was second in his final prep – Super Saver couldn’t get by longshot Line of David in the Arkansas Derby; Street Sense couldn’t outgame Dominican in the Blue Grass; Funny Cide was outgamed by Empire Maker in the Wood Memorial; Monarchos couldn’t catch Congaree in the Wood; Real Quiet couldn’t catch Indian Charlie in the SA Derby; Silver Charm was outgamed by Free House in the SA Derby; Grindstone couldn’t get past Zarb’s Magic in the Arkansas Derby; Go For Gin couldn’t catch Irgun in the Wood; and Lil E. Tee couldn’t get by Pine Bluff in the Arkansas Derby. The list goes on, so he’s in good company. I actually was all prepared to rank him higher until Bodemeister turned in his monster performance and added a major obstacle for him. I was hoping to see him rate off the pace again, but the lead was there for the taking. Considering all the craziness that went on at the barn that day, having to get his tail dyed and then un-dyed, who knows if the distractions affected him at all. I thought he ran a terrific race, and the biggest irony of all is that the horse who dogged him and prevented him from getting a breather on the far turn was his own stablemate. History shows if you’re going to try to win the Derby on the lead, this isn’t the way to go about it. 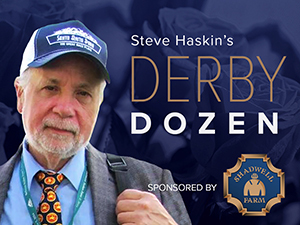 In the past 40 years, what did wire-to-wire Derby winners Riva Ridge, Bold Forbes, Seattle Slew, Spend a Buck, Winning Colors, and War Emblem have in common? They all won their previous start, and won by daylight. In order to win the Derby on the engine you have to have shown dominance in your previous start, the way Bodemeister did. But in the end, I must say I have even more admiration for the colt than I did before. I just want to see a return to the running style he showed in the Gotham. After the Derby he can go back to his hell bent for leather style. He won’t get away with a Florida Derby scenario again, not with Hansen and Bodemeister in there, so it’s time to concentrate on settling back off the pace again, something he’s never had any problem with. Unfortunately, we won’t get to see him either until the Wednesday before the Derby when he ships in with the Pletcher pair. One thing is for sure: with the turn of events these past two weeks, you can count on him being the forgotten horse, especially for a Florida Derby winner. What he has going for him is that we likely have not seen the best of him, and there’s really no telling how good he is. He has all the tools, and the pedigree, and the jockey, so he is another who could be an intriguing exotics play at a big price. And now for the mother of forgotten horses. Pletcher or no Pletcher, he has been swallowed up in the recent grade I feeding frenzy, and his one-time luster has faded. But the truth is, he actually received the same Thoro-Graph figure as Union Rags in the Florida Derby and a faster number than the winner, running basically the same strong fig in all three starts this year, so he’s more live than people might think. But first he has to get in the race, and is going to need some help. It has been well established that Castellano didn’t do him any favors by concentrating too long on Union Rags, looking over his shoulder for him on several occasions. He then parked El Padrino wide on the far turn and had to fan 5-wide at the top of the stretch. He likely will high-tail it over to Gemologist, leaving the mount open on this colt, who at one time looked to be Pletcher’s main Derby hope – post Algorithms and pre Gemologist. In short, don’t ignore him based strictly on the Florida Derby. This is as laid back a colt has you’ll ever see, and who knows, maybe he just got bored hangin’ out with Union Rags away from the real action. He had a pretty big bandwagon starting to fill up before last weekend’s action, and there’s no reason why anyone should jump off now. It was kind of odd to see Mike Smith commit to him before riding Bodemeister, but he quickly jumped on to the Baffert colt after the Arkansas Derby. No problem. His new jockey, Garrett Gomez, will be riding a vastly improved horse with the right running style and the right trainer. So if you were looking to hop aboard his bandwagon before Saturday, nothing has changed as far as he’s concerned. He will be going into the Derby off a six-week layoff, so we’ll see how hard Asmussen trains him. That’s normally not his style. But I love the fact he's been at Churchiil and already has had two works, including a bullet five furlongs in 1:00 1/5, with a strong gallop-out. He is one I will be following closely once I get to Kentucky. I can feel the vibes already. Although I believe Went the Day Well, whom he replaced in the final spot, has a better shot of actually winning the Derby, I had this colt at No. 5 on my first Dozen list and it was good to see him bounce back to some sense of credibility. I couldn’t desert him now. His Arkansas Derby third was a good step forward, and with his 2-year-old form and foundation, it put him in position to possibly pick up a piece of it in the Derby. There were several signs in the Rebel that pointed to a comeback effort, and while he didn’t threaten the winner, he did finish a neck behind Secret Circle for second, making up six lengths on the Baffert colt from the Rebel finish. Every indication is that he’s ready to take another move forward. Consider him virtually in a tie for the No. 12 spot. With a six-week layoff between the Spiral and the Derby, it is understandable if he falls through the cracks. But after the way Animal Kingdom trained over the Churchill surface last year, you can be sure people will be watching him closely in the mornings. He is another who has faded from the spotlight following his defeat to mega-longshot Hero of Order in the Louisiana Derby. But he did throw a shoe before the race, and he ran hard throughout. He’s still a very good horse. We just have to wait and see if he’s ready for the Derby. He redeemed himself with a fast-closing third in the Louisiana Derby following two subpar efforts at Santa Anita. He does have a big closing kick, as he demonstrated in the CashCall Futurity and Real Quiet Stakes at Hollywood. He could make some noise at a monster price. They may have crawled in the Illinois Derby, but he at least wiped out the only blot on his record, the Gotham Stakes, by returning to the form that saw him finish a fast-closing fourth in the Remsen Stakes. On paper, he’s not fast enough, but he’ll win his share of stakes this year. His victory in the UAE Derby in his 3-year-old debut was impressive, but it’s still hard to get past that dreadful performance in last year’s BC Juvenile in his only dirt appearance. He’s the only horse to have won farther than 1 1/8 miles. You certainly have to admire him. He tries hard every race and always gives his all. He may have finally hit his wall at the eighth pole of the Arkansas Derby, but still managed to finish second, giving him five wins and two seconds in seven career starts. I’m not going to get too down him for his sixth in the Blue Grass Stakes. Although he was two-for-two over the Woodbine Polytrack, he’s become a solid dirt horse and may not have cared for the Keeneland Poly. He did win the Tampa Bay Derby, but the Tampa form this year was pretty suspect. He does have talent and is honest, so you know he’ll give his all. He may be the most disappointing of all the 3-year-olds, never coming close to duplicating his 2-year-old form and taking a step backwards in the Santa Anita Derby. Perhaps he just didn’t like Santa Anita, so Baffert will train him at Churchill and see how does.